In Dublin the Easter Rising is over. 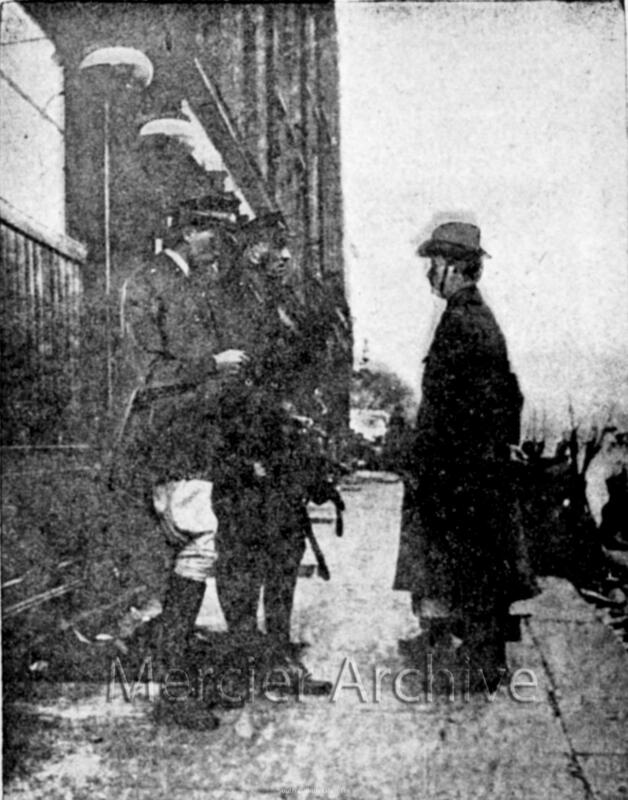 The outlying rebel garrisons have surrendered after receiving Pearse’s order to lay down their arms; to ensure that fighters from the Irish Citizen Army also surrender, Pearse’s order is counter-signed by James Connolly. Another late surrender is that of the rebels holding formidable positions at Boland’s Mill. Their commander, Éamon De Valera only orders his men to give in after protracted negotiations. Many of them destroy their weapons rather than hand them over. In Dublin the Easter Rising is drawing to a close. Its leaders have abandoned the General Post Office on Sackville Street: the position had become untenable after shelling from the British gunboat the Helga had set it ablaze. After spending the night on nearby Moore Street, Patrick Pearse, the rebels’ leader, accepts the inevitable. He decides to surrender, in order to prevent further needless loss of life. As the rebels are marched away into captivity, there are instances of them being jeered by passing Dubliners. Pearse surrenders on behalf of all the rebels. The British arrange for him to send orders to surrender to the various remaining garrisons. The siege of Kut-al-Amara is over. General Townshend has surrendered unconditionally to the Turks under Halil Pasha. The Turks take some 13,000 prisoners. These include nearly 2,800 British soldiers, of whom 277 are officers, and around 10,500 Indians, of whom 204 are officers. This is a great triumph for Halil and one he does not have to share. 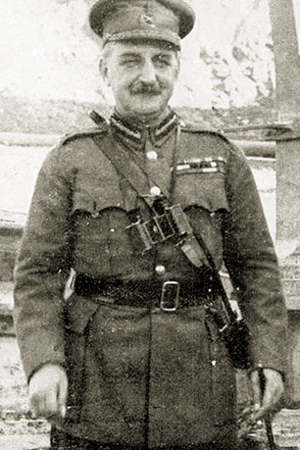 The overall commander of Turkish forces in Mesopotamia had been General Goltz, a German general. However Goltz died just ten days ago, officially of typhus, but there are rumours that he was poisoned at the behest of Turkey’s leaders. His death means that all the glory for Kut’s fall goes to Halil. As Turkish troops enter the town there are some instances of fraternisation between them and the town’s erstwhile defenders. But the Turks also begin to extract vengeance on local civilians they suspect of treachery during the siege, with the first public executions of collaborators taking place. Turkish officers are also angry that the British have destroyed their cannons before surrendering, as they had hoped to seize these as trophies. 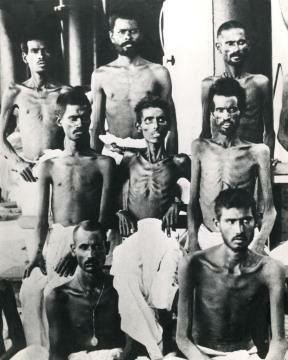 Many of Townshend’s men are in a desperate state thanks to the short rations they have been on. They are despondent at having to surrender but this dismay is tempered with hope, as they think their sufferings are coming to an end. They are wrong. In a last attempt to secure the freedom of the besieged British garrison of Kut-al-Amara, three British intelligence officers today meet with Turkish commander Halil Pasha. Colonel Edward Beach, Captains Aubrey Herbert and T. E. Lawrence have travelled up the Tigris from Basra. Now, blindfolded, they are taken through the Turkish lines to meet Halil. The British officers make another attempt to bribe Halil to let the Kut garrison go free, but the Turkish commander is still not interested. They also appeal for him to show clemency to any of the townsfolk of Kut who have provided assistance to the British, but Halil curtly tells the three officers that the fate of the town’s civilians is an internal matter for the Turkish authorities. He gives no assurances that there will be no reprisals. Halil has a request of his own. He reminds Beach and his colleagues that after their long siege the British and Indian troops in Kut are now very debilitated. They will have to be transported away from Kut but the Turks lack the ships to do this, so the prisoners will have to march, something many of them will be incapable of doing. Halil asks the British to supply boats that he can use to bring the prisoners up the Tigris to Baghdad, after which the boats would be returned to the British. The British decline to supply the ships. Halil draws the conclusion that they are not too concerned with the fate of their prisoners. And if the British do not care about their fate, why should he? And then abruptly Halil informs the British that the meeting is at an end. He has no more time to speak to them because he has important matters to attend to. And indeed he does. What the British officers do not know is that Kut has already surrendered this morning. Halil has the occupation of the town and the disposal of the prisoners to oversee. In Dublin the Easter Rising continues. General John Maxwell arrives in the city today to take command of the British forces. Under martial law he has extraordinary powers in Ireland. A veteran of colonial warfare, Maxwell is determined to bring the Rising to an end and to pacify the country, by any means necessary. In fact the Rising is already drawing to a close. Crown forces have flooded the city and have successfully isolated the various rebel garrisons. Some rebel positions have been overrun and the situation in others is increasingly desperate. The rebel headquarters in the General Post Office on Sackville Street is now in flames, as are many surrounding buildings. The British mounted artillery on the Helga, a coastal protection vessel, and have sailed it up the river Liffey to shell rebel positions. The use of incendiary shells has set the city centre ablaze. With the GPO now untenable the rebels there attempt a breakout. In the evening they sally forth but make their way only to nearby Moore Street. Here they hunker down for the night, knowing that the end cannot be far off. In Mesopotamia the siege of Kut-al-Amara is drawing to a close. The British garrison has been on short rations for weeks and is now almost completely out of food. Attempts to raise the siege have failed and now imminent starvation obliges General Townshend to discuss surrender terms with the Turks. Today Townshend meets Halil Bey, the Turkish commander of the besieging forces. The British consider the Turks to be a shifty and dishonourable people, so Townshend has been advised to appeal to Halill’s avarice and vanity in attempt to secure his army’s freedom. He asks Halil to allow his men to retreat from the town without being taken prisoner, promising that they will not take up arms against Turkey again. In return Townshend offers Halil 40 cannons to parade as trophies and one million pounds in cash. Halil is disappointingly non-committal in response to Townshend’s offer. The British commander returns to Kut with the grim feeling that the Turks will not be satisfied with anything other than the unconditional surrender of his entire army. In Dublin a thousand Irish rebels are fighting against the British Empire. In France and Belgium however far greater numbers of Irishmen are serving in the British empire, all as volunteers (conscription has not been extended to Ireland). Near Hulluch men of the Dublin Fusiliers and Inniskillings are part of a British force holding ground captured in the Battle of Loos last year. Over the past few days there have been ominous signs. Rats have been seen climbing out of the German trenches and heading into no man’s land. Then a German deserter reveals that a gas attack is imminent (gas leaking from its containers has scared off the rats). Today the Germans launch their chemical attack. They let the wind blow the poisonous cloud of chlorine towards the British and then send their infantry forward after it. 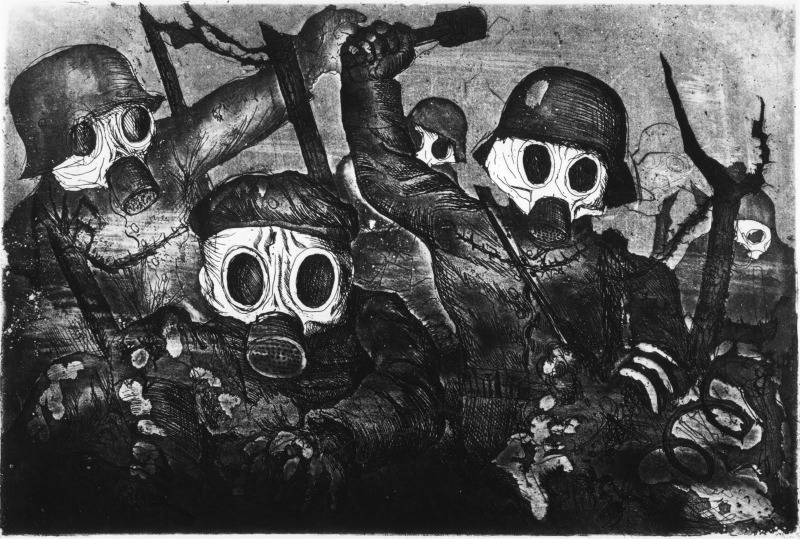 The gas inflicts considerable casualties on the British, many of whom were unable to put on their protective masks in time. But the Germans also suffer from their own poison, thanks to British artillery bursting open the gas cylinders and unexpected changes in the wind direction. The German assault fails. Officers praise the performance of the Irish troops. Both sides suffer heavy casualties, mostly from the Germans’ poison gas.